THE STORY: Our client, who lives just blocks from the gallery in South Boston, visited our annual Salon Show in early 2018. This exhibition is a collection of the newest artworks by our represented artists, as well as a few new artists we are featuring for the first time. I love this show because it is incredibly eclectic, it is a wonderful show to visit if you are a new or established collector, there are so many interesting artworks and styles on view, the exhibition helps guide our collectors in developing their tastes. After viewing Nicole's available work in December, the client left to consider whether the work was the right fit for his space. He spent a few months thinking about the piece, and then contacted us this summer to move forward with installing the work. THE ARTWORK: Nicole Patel's artwork represents all things minimal. Her graph series, created with a single thread across a muslin surface, explore elements of drawing and design through textile. Patel's artwork pairs beautifully with the sleek and sophisticated style of the minimalist home. 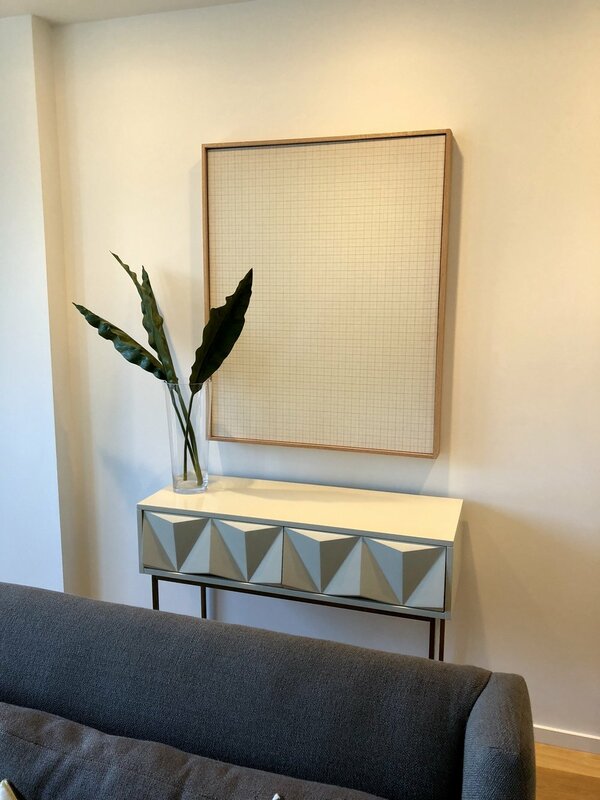 We felt the combination of the geometric grid and the natural aspects of Nicole’s materials were a perfect fit for this sleek modern apartment perfectly. OUR ADVICE: We encourage collectors to go at their own pace when deciding on artwork. Buying a new piece for your home is an important decision, for some - they are quick to choose and fill their walls with art, others like spending more time carefully considering the options. Although, if you spend too much time thinking about a piece it may be sold by the time you contact the gallery! We were thrilled with how perfectly the artwork fit into his space. 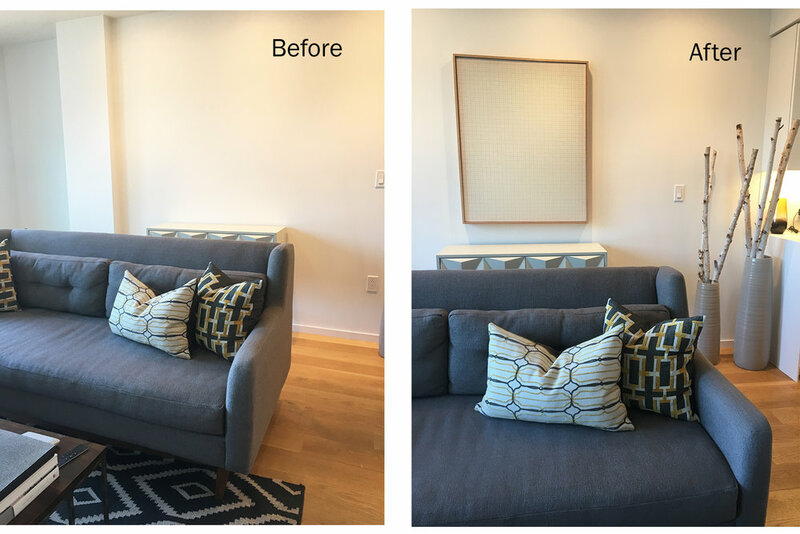 Our installer, Jonathan Stangroom, and the Abigail Ogilvy team goes to the client's home when installing to give advice on where the work should hang, how high, and if objects or other artwork should be moved around to make room for the new piece. Patel’s work fills the room with a presence. It acts as an anchor for the viewer, like the steady breaths of meditation, allowing us to gain a new vantage point for observation and acceptance. As a new art collector, this is the first piece the client has ever acquired for his space. We are always excited to help build a new collection, and we are so grateful for our client's thoughtfulness when choosing Nicole Patel's artwork. Nicole Patel, "Aqua Graph," Cotton Thread on Natural Muslin with Red Oak Frame, 40 x 32 in. Japanese contemporary artist Takashi Murakami has brought a splash of color and a lot of attention to the Museum of Fine Arts, Boston recently with the exhibit Lineage of Eccentrics, A Collaboration with Nobuo Tsuji. Professor Nobuo Tsuji assumed the role of mentor and teacher to Murakami in 2009, an act that would allow the artist to engage with historical Japanese art and expand his knowledge in the traditional art forms. The exhibit has taken Murakami’s explosive, vibrant artworks and paired them with pieces from the museum’s extensive collection of Japanese art, creating a conversation between past and present. The near sensory overload is on par with the New York Times description of the artist, “Takashi Murakami rocketed to international fame in the art world for his Pop Japanese anime-inspired characters and motifs that proliferate playfully and menacingly across paintings, sculptures and a line of commercial products.” With fifty of Murakami’s works on display paired with a matching number of carefully curated Japanese works, the museum visitors undergo a unique viewing experience. Walking into the gallery, visitors are greeted by Transcendent Attacking a Whirlwind, a colossal new work by Murakami illustrating an oversized sea serpent surrounded by curling waves and a background of tessellating pattern. Murakami’s new work was inspired by the six-panel folding screen of the same title, created by Soga Shohaku in 1764 which is now in MFA’s Collection. These pieces act as a perfect introduction to the marriage that Senior Curator of Japanese Art, Anne Nishimura Morse, and Japanese Art Historian, Nobuo Tsuji, have cultivated between pop-art and traditional Japanese artwork. The contrast between Murakami’s contemporary artworks against the beautiful scrolls and images of centuries past simultaneously charm the viewer and display the lasting effect that traditional Japanese culture has had on the present. The exhibition is organized into six thematic sections, beginning with the exploration of Murakami’s coined term of “Superflat”. Murakami’s Superflat Manifesto, 2000, articulates his artistic approach in which he drastically compresses the space between three dimensional objects and metaphorically flattens distinctions between “high art” and “low art”. The other five galleries are organized based on Tsuji’s principles of Japanese art history: animation, kazari (ornamentation), asobi (playfulness), religiosity and eccentricity. 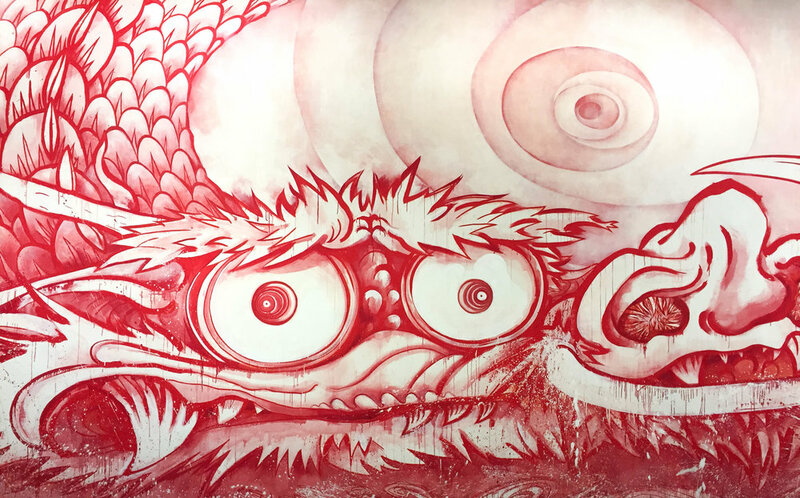 One of the most memorable pieces in the show is Dragon in Clouds—Red Mutation, a twelve foot by fifty-nine foot painting that Murakami created in just twenty-four hours. The gigantic painting came to be in 2010, after Tsuji challenge Murakami to paint his own work without the help of any of his studio assistants. After putting himself on a twenty-four hour time limit, and pulling inspiration from Soga Shohaku’s 1763 thirty five foot long Dragon and Clouds, Murakami worked for an entire day. The final product was the massive and powerful acrylic on canvas artwork. With the show being so bright and colorful, it easily lends itself to social sharing, making it a popular backdrop to countless Instagram photos. In the room housing Kawaii – vacances (Summer Vacation in the Kingdom of the Golden), visitors can be found going as far as laying on the ground to capture the psychedelic effect the happy flowers and metallic finish. With a guiding phrase on the wall reading: “If you don't share a photo from this exhibition, did you really visit? Share your #mfaMurakami photos with @mfaBoston.” A controversial statement that has received varied feedback, raising the topic of how institutions should be using social media to handle self-promotion through art. The phrase certainly questions the intentions of the exhibition; whether to grab the attention of snap-happy social sharers or start a cultural conversation about Japanese art past and present – and which is more important to the museum. Detail of: Takashi Murakami, Kawaii-Vacances (Summer Vacation in the Kingdom of the Golden), 2008.